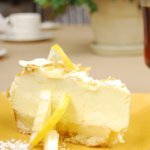 Lemon cream pie is a Southern specialty which was first made in the 1920s, although lemon flavored desserts had emerged much earlier. Treat yourself to a slice of this delicious pie on the National Lemon Cream Pie Day celebrated on November 29. Lemon cream pie is made with delicious lemon flavored curd typically served on a butter pie crust. However, there are other variations which can be served on graham cracker or shortbread. Lemon curd can be replaced with cream cheese or other light and creamy fillings. The National Lemon Cram Pie Day is the perfect excuse to be adventurous and taste unusual pie variations. Lemon cream pie is a popular dessert served in many restaurants and coffee shops. Therefore you can celebrate this food-related holiday by going out or picking a pie at your favorite local bakery. You can also cook this refreshing dessert yourself following our instructions. This pie is very easy to make as it doesn't even need baking. In mixing bowl, beat 8 ounce softened cream cheese until creamy. Add 14 ounce sweetened condensed milk and 1/4 cup lemon juice. Beat until very creamy. Carefully fold in 20 ounce lemon pie filling and stir until creamy. Pour mixture into 9 inch graham cracker pie crust. Put in the fridge for a few hours.